Not only did Evan Cattanach work at more distilleries than many malt fans have even visited, he was also in the vanguard of the modern wave of international Scotch whisky brand ambassadors. 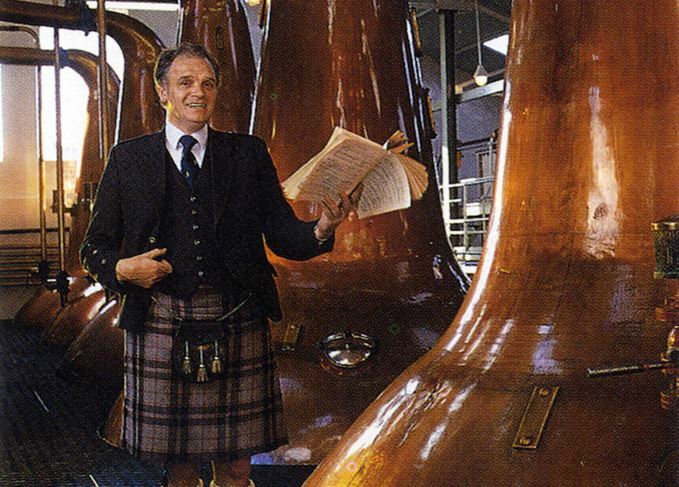 Richard Woodard reports on the passing of a true character of the whisky industry. Evan Cattanach, who has died at the age of 80, spent the last 20 years or so of his life in the US, but will forever be associated with Scotland, Scotch whisky and the distilleries that make the spirit he did so much to celebrate. His Scotch whisky career spanned two distinct and lengthy phases: 33 years during which he managed or worked at a succession of distilleries around Scotland; then, in the US, roughly another two decades, during which he blazed a trail as what was to become known as a ‘brand ambassador’ – communicating the joy, history and culture of Scotch whisky to as wide an audience as possible. Born on 15 October 1935 at Kingussie, Inverness-shire, Evan attended Kingussie Secondary School and completed a four-year term in the Royal Navy before going to work for his father on the Cattanach farm. In 1961, at the age of 25, he got a job at Scottish Malt Distillers, the production arm of Johnnie Walker and, as a trainee manager, began an intensive period of training at a succession of Scotch whisky’s most famous distilleries. So varied was Evan’s early career that there’s some slight confusion about precisely how many distilleries he worked at in total: it may be 15, it may be 18, but it included as many as five of the Classic Malts locations (Talisker, Oban, Lagavulin, Dalwhinnie and Cragganmore). Some of the distillery names are famous, while others, long since closed, have passed into obscurity: Balmenach, Towiemore, Benromach, Glentauchers, Aberfeldy, Oban, Muir of Ord, Dailuaine, Millburn, Talisker and Rosebank all featured in his early training. Evan’s first job as assistant manager came at the now closed St Magdalene/Linlithgow plant in the Lowlands, followed shortly afterwards by another assistant’s post, at Lagavulin on Islay. He secured his first manager’s job at Dalwhinnie in 1965, moving on to Caol Ila three years later, and then to the now defunct Coleburn distillery in Fogwatt in 1972. Evan ran Cragganmore from 1980 to 1983, but was most strongly associated with another Speyside plant, Cardhu, which he managed for a 10-year stint from 1983. It was while at Cardhu that Evan was picked out by Johnnie Walker MD David Conel to become what is claimed as the first master distiller to travel the world telling people about Walker and single malt whiskies. In 1991, he was asked by the company's US distributor, Schieffelin & Somerset, to become the first Johnnie Walker brand ambassador, conducting the Johnnie Walker Mentor Program to educate younger consumers on the intricacies of Scotch whisky. Although he moved to the US in the 1990s, Evan’s new ambassadorial role took him around the world, to an estimated 200 cities in 40 countries. In the process, he became an unofficial representative of all things Scottish, presiding over whisky dinners and famed for his impassioned ‘Address to the Haggis’ at Burns Night celebrations. To Dr Nick Morgan, head of whisky outreach at Diageo – Evan worked for the company and its forebears throughout his career – he was ‘the model for brand ambassadors in the way that we know them today’. While there had been export directors and story-telling travelling salesmen in the past, Evan offered a direct route back to the product and the way it was made. ‘It was important to get back to the source of wisdom and knowledge – and of corny Scottish songs!’ says Dr Morgan – a reference to Evan’s frequent fondness for singing. ‘I have known Evan for my entire life – with a blip of 25 years in the middle. Evan’s son Gregor and I went to primary school together at Inveravon School in Ballindalloch. ‘I met Evan again during WhiskyFest New York around 14 years ago. To be able to speak to a man with so much knowledge of Speyside and the whisky industry! ‘I remember clearly telling Evan several times, including at his granddaughter’s birthday party, that he should write a book about his time and experiences. But, true to Evan’s typical modesty, he insisted that other people knew far more than he, and that nobody would be interested in what he had to say. ‘Evan was my first mentor back in the 1990s. He trained the first whisky ambassadors here in the US. ‘Whisky Magazine once asked me for my most memorable drinking moments, so I told them of the time I was at Royal Lochnagar distillery with Evan and the other masters of whisky. He and I were standing by a liquor cabinet in the lounge, and his eyes fixed on a bottle of Dalwhinnie 36-year-old. ‘He started to get choked up, but with a big smile on his face. I asked him what was going on. He said that he was managing the distillery at that time, and that his oldest daughter was born that very year. ‘We opened the bottle, and the two of us toasted his daughter Lorna. To drink the whisky that meant so much to the man who made it more than four decades after he made it has always stuck in my memory. ‘Arguably, in the 20th century, he was the model for brand ambassadors in the way that we know them today. Evan was one of the first to start doing it in the mid-1980s, and he became a model that certainly we followed in what became United Distillers and Diageo. The influential US education and mentoring programme will close with the loss of about 40 jobs.